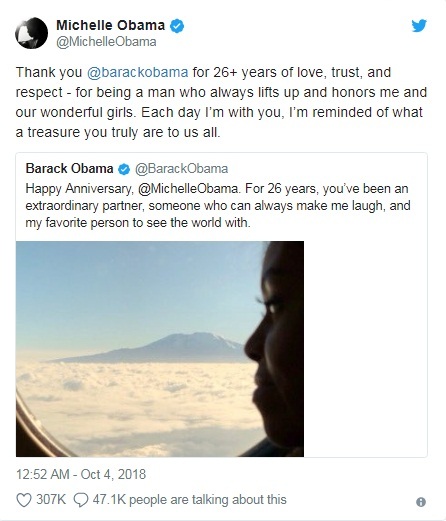 Former President of the United States, Barack Obama tweets a warm message for Michelle Obama, his wife on the occasion of their 26th wedding anniversary. 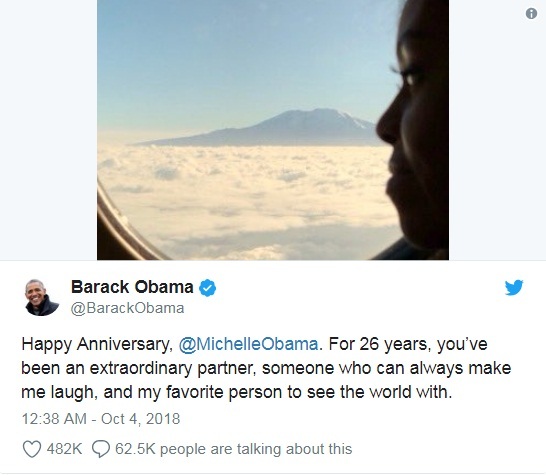 Taking to social media, 57-years old Barack Obama posted a candid picture of his wife, acknowledged her as an ‘extraordinary partner’. He even mentioned her as the one, who can always make the former US President laugh and enjoy. Obama also mentioned that the former first lady is his favorite travel partner as well. In response to his post, Michelle Obama also expressed love for her husband and thanked him for his love and respect. She also mentioned that how Obama is a man, who always honour her and lifts-up and mentioned about their wonderful girls. Barack Obama and Michelle Obama got engaged in 1991 and tied the knot soon on 3rd October 1992. They have two daughter- Sasha Obama and Malia Ann Obama.